Burlington Mayor Miro Weinberger was on the job at Nunyuns Bakery & Cafe in the Old North End just after 8 a.m. on a recent Thursday. Wearing a suit but no tie, the mayor, who likes to meet informally with constituents over coffee, laid out the referendum questions on this year's city ballot — including two intended to enable the massive Burlington Town Center redevelopment. He explained why each is important and then took questions from the dozen or so attendees. The informational session was one of many Weinberger has attended in advance of Election Day to promote a $250 million project he says is crucial to the city's future. At every turn, members of a group called the Coalition for a Livable City have dogged the mayor — and the project. 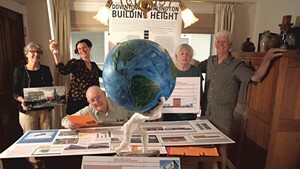 Members say the height is out of scale with low-rise Burlington. At least three coalition members listened as the mayor spoke at Nunyuns. Albert Petrarca, one of Weinberger's fiercest detractors, held up a sign with "TIF" and "MALL" circled and crossed out in red ink. When Petrarca got a chance to speak, he asked a loaded question and called the ballot items a "gift" to a millionaire developer. "Given how immoral you have been as a human being in terms of social policy, in a town that considers itself quite progressive," Petrarca thundered, "how do you look at yourself in the mirror every day, and have you ever asked yourself, maybe you're not a good fit for this town?" The intense questioning — and personal attack — did not seem to rattle the pragmatic Weinberger, who has faced similar scrutiny at other times during the four-plus years he's been in office. 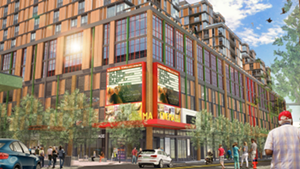 A former developer with the Hartland Group, Weinberger has been a frequent target of critics and activists who claim his goal is to pave over a vibrant, eclectic city. 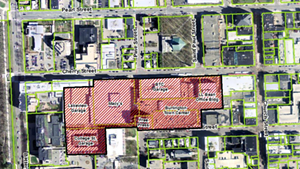 Everyone agrees the new mall would forever change downtown Burlington. The debate is whether that would be a good or bad thing. After almost a year of public wrangling, both sides are making final pushes to convince Queen City residents to see things their way. 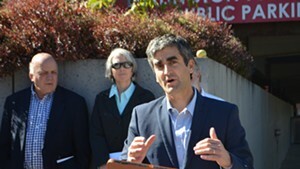 Coalition members often shadow the mayor and his allies at various informational sessions and ask questions or comment on the project. 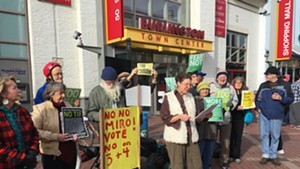 The group has organized its own events, run ads in Seven Days and distributed thousands of leaflets urging residents to vote "no." The coalition has made itself heard, dominating the public comment sessions during meetings and hearings. Its lobbying has led to better environmental building standards. Whether it's been effective at influencing voters is another question, but the two-term mayor is taking no chances. He's in full-on campaign mode, devoting countless hours before, during and after the workday — not to mention weekends — to the cause. "A couple other times I've pushed hard for a variety of ballot items," Weinberger told Seven Days. "We've had a good track record of actually being able to explain them well, and the people of Burlington have supported the direction. I'm hopeful that's going to happen here." 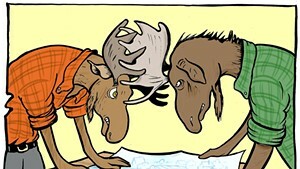 Weinberger has created an alliance of his own. He proudly ticks off some of its members: the Champlain Housing Trust, the Vermont Natural Resources Council and former Progressive mayor Peter Clavelle, an influential figure in Burlington who describes himself as dedicated to smart, sustainable development. 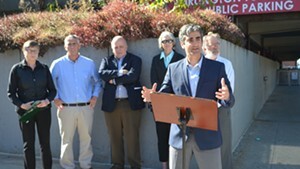 Weinberger last month announced support from several environmental groups, including the Conservation Law Foundation. 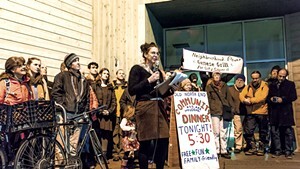 "A group famous for killing projects all over the state ... stood with us," Weinberger boasted more than 10 hours after Nunyuns, at an evening meeting with Ward 5 residents. "So the leading environmentalists in the state are saying, 'Put environmental benefits squarely on the positive side of the scale.'" City councilors were empowered to have the final say on the zoning change. But the Coalition for a Livable City planned to circulate a petition and force a special vote on it. To preempt the petition, Weinberger asked the council to vote on letting residents decide. By an 8-3 tally, councilors agreed to support the zoning change and put it on the November 8 ballot. Progressive councilors Max Tracy and Selene Colburn and independent Sharon Bushor voted "no." All but one — Tracy — also green-lighted the mayor's tax increment financing strategy by agreeing it should also be on the ballot. Vermont law dictates that voters must approve any TIF spending. Opponents of the proposed project compare it to the waterfront development scheme known as the Alden Plan, which failed in 1985 after residents voted down a bond. That project would have put condos on the Burlington waterfront instead of the parks and public features there today, according to Tracy. "There may be other options out there, and we can do better," he said. Council president Jane Knodell, a Progressive, has been one of Weinberger's most ardent allies, as has Joan Shannon, a Democrat. Both have been enthusiastic participants in almost every informational get-together and have made their own short videos explaining why they believe residents should support the mayor's ballot initiatives. Weinberger has been strategic in rounding up votes. Because the project would feature 80 housing units for Champlain College students, he trekked up the hill to the University of Vermont. At an October 11 Student Government Association meeting, the mayor encouraged students to support the ballot items. His pitch resonated, SGA president Jason Maulucci told Seven Days, because fewer Champlain students looking for housing downtown could ease the costs — and free up housing stock — for UVM kids. "There's precedent in Burlington where 10 votes can make a difference," Maulucci said, referring to Bernie Sanders' unlikely 1981 mayoral victory. "So if students can turn out in support of this, I think it could move the dial." Weinberger is using a political action committee to fund literature, events and ads. He revived the Partnership for Burlington's Future, a PAC he created in 2012 to help pass several ballot items that year, including a fiscal stability bond to consolidate debt stemming from the Burlington Telecom fiasco. 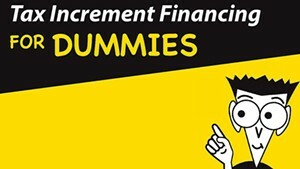 He used it again in 2014 to secure a winning vote for tax increment financing waterfront improvements such as building the skate park and rerouting the bike path. Along with raising money, his backers have urged supporters to hold house parties to inform neighbors. They have circulated talking points to rebut project opponents and convince undecided voters that have wound up in Front Porch Forum and Facebook posts. The PAC raised more than $21,500 in a three-week span last month and spent about $12,000 on marketing materials such as brochures and advertising, according to campaign finance forms filed last Friday. The Coalition for a Livable City, which registered with the Secretary of State's Office in late June, has raised about $10,000, according to a campaign finance filing report from mid-October and a GoFundMe page run by the group. It's unclear how much money the group has spent because not everyone has filed their expenditures yet, treasurer Steve Goodkind said Monday. Cash has gone to ads and printing copies of fliers, he said. "We'll spend it all," Goodkind told Seven Days. "No problem." What coalition members lack in cash they make up for in gumption. Members lobby on Facebook. They've papered houses with leaflets urging "no" votes. They've handed out flyers all summer and fall at the Burlington Farmers Market and outside City Market/Onion River Co-op. A Not Happy (About the Zoning Change) Hour on October 23 at Radio Bean on North Winooski Avenue featured music and doughnuts. "We're trying to get the hipster vote," Genese Grill, one of the group's most outspoken members, said with a laugh. Tracy, who spoke at the Radio Bean event, was impressed by the Coalition for a Livable City's organization and mission. "There's a level of discourse and involvement I haven't seen in Burlington around an issue in some time," he said. Last Thursday, some 70 people crowded into a second-floor conference room at the BCA Center on Church Street for a panel discussion on the Burlington Town Center project and how the city can build in a way "that works for everyone." Panelists, including Colburn and Bruce Seifer, a former longtime assistant director at the Community & Economic Development Office, described their perspectives. Some urged residents to vote "no." "We're looking at the mall project as a case study," said James Haslam, the executive director of Rights & Democracy, the group that hosted the event. "We're not promoting a vote one way or the other. We did invite the city, but they didn't come." That's likely because Weinberger was down the street at a competing informational Pop-Up Beer Hall inside the Burlington Town Center. 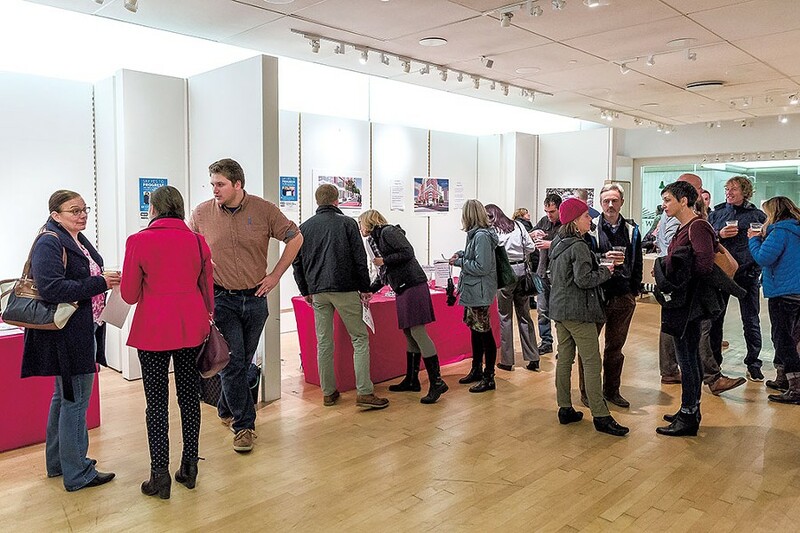 While attendees wandered through the empty, long-abandoned Gap store, drinking free beer, cider and wine, Weinberger exalted the project and urged all to vote "yes." The three-hour session, which included a question-and-answer forum, drew more than 100 people, including Sinex and city councilors Knodell and Shannon. It was hosted by Together for Progress, a group created by the Burlington Business Association. Backers know what Weinberger's up against. The coalition — members of it, anyway — have foiled and needled Weinberger before. 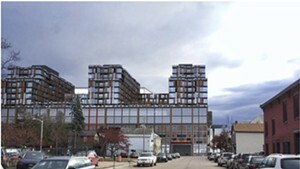 Grill and others vigorously protested a proposal to allow new housing in the South End Enterprise Zone, a section of Pine Street animated by numerous artist studios. Weinberger eventually dropped his support of that change but admitted to being frustrated. "What are we going to do about the fact that we have a real serious housing challenge?" he asked last year. 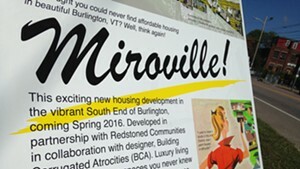 South End artists used satirical works to ridicule the administration's housing proposal, building a cardboard "Miroville" along Pine Street. 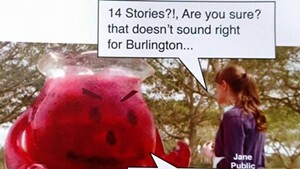 This time around, mocking postcards have surfaced accusing Weinberger and his supporters of "drinking the Kool-Aid" by backing the mall plan. Pressing now for another project that would add housing stock, Weinberger has one more big chance to sway voters. He's planned a "telephone town hall meeting" for November 6 — the Sunday before Election Day. Weinberger will dial up all the landline numbers in the city simultaneously, and residents can opt to participate as if they were on a giant conference call. It's unclear if the mayor's message is connecting. Even after his community discussion at Nunyuns last month, several attendees said they still haven't made up their minds. Jean Waltz, an art teacher at Rock Point School, said she's leery of major projects after the Moran Plant redevelopment and the Champlain Parkway both stalled. She intends to do more research before casting her vote. "How come the mall isn't a super-success the way it is right now?" Waltz asked, noting there's no guarantee that a new, improved version will be "this amazing thing that generates all these tax dollars." She added, "Just because you build it doesn't mean they're gonna come." Correction, November 2, 2016: A previous version of this story incorrectly said that lobbying efforts by the Coalition for a Livable City led to an increase in affordable housing units at the proposed development.